Two groups of students from Years 7, 8 and 9 have recently taken part in both literacy and numeracy projects organised and delivered by Wrexham Football Club. The projects are designed to help improve students’ literacy and numeracy skills with an emphasis on football related activities. Tasks include writing match reports and creating graphics from crowd attendances. Each project last for 5 weeks and students have really benefitted from this work as well as thoroughly enjoying the experience. 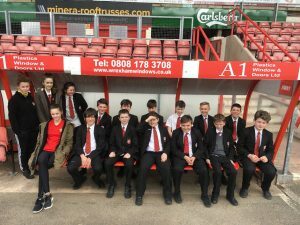 During the projects the student are given the opportunity to visit Wrexham’s famous Racecourse ground and Year 8 and Year 9 students took this trip on Friday 31st March. The visit included a lesson about numeracy related to Wrexham Football Club facts and a tour of the stadium. The students also met the Assistant Manager and took part in a question and answer session with him. Thanks to Steve Dale for arranging both projects and we look forward to completing the Health and Wellbeing course which will take place later during the year.